The market doesn't seem to have a lot of faith in shares of Alliance Resource Partners, Chicago Bridge & Iron Company, or Gilead Sciences lately. Is this an opportunity for you? Yes, even in today's market, where were we are seeing all-time highs and some pretty inflated valuations, there are still some pretty cheap stocks out there. That may be because a company is a standout performer in an otherwise dismal industry, one bouncing back from the ups and downs of a cyclical business, or just a victim of the short-term thinking of the market in general. Three stocks that really stand out as cheap dividend stocks are Alliance Resource Partners (NASDAQ:ARLP), Chicago Bridge & Iron Company (NYSE:CBI), and Gilead Sciences (NASDAQ:GILD). Here's a quick look at why these companies are trading at cheap valuations and whether you should consider picking up shares now. It's hard to fault the market for having such a negative outlook for Alliance Resources Partners and the coal industry in general. Even though there is a glimmer of hope that the change in presidential administration could lead to an uptick in coal consumption over the next couple of years, companies that are making investments in energy generation assets that will last multiple decades aren't likely to shift from the current track of replacing older coal facilities with either natural gas, wind, or solar. That being said, there are still some market trends in the coal industry that work in Alliance's favor. Coal in general has a long way to fall, and the coal-producing regions where we expect to see the largest declines are not places where Alliance has assets. In fact, production from the Illinois Basin, where Alliance has most of its mines, is expected to grow as it displaces production from other regions over the next decade or so. This suggests that Alliance has a much longer runway than many expect. Coal is a tough business to be in right now, but Alliance has done it better than almost every other coal producer in the country by maintaining a modest balance sheet, and management has been prudent by trimming its payout to shareholders before cash management has become a severe issue. At an enterprise-value-to-0EBITDA ratio of just 3.32 times and a distribution yield of 7.1%, Alliance looks awfully cheap right now. Chicago Bridge & Iron also hasn't received much fanfare from Wall Street recently, either, but much of that has to do with the fact that most of its customer base is in the energy sector. As an engineering, procurement, and construction specialist for large energy projects such as power plants and LNG facilities, the company's bottom line has been impacted pretty severely by the spending cuts from many of the largest oil and gas producers. As a result, Chicago Bridge & Iron's revenue peaked around the beginning of 2015 when those spending cuts starting taking hold, and have been on a moderate decline ever since. CBI Revenue (TTM) data by YCharts. 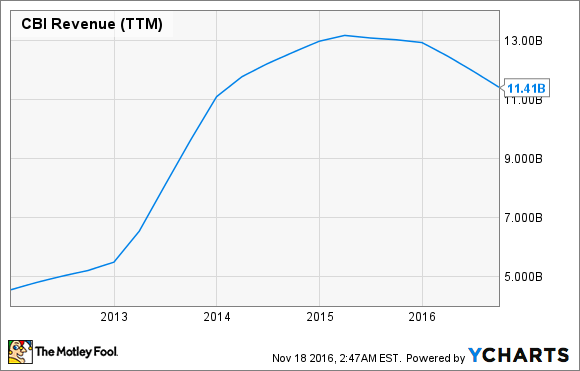 One thing to consider with construction companies is that they are a cyclical business that will go through this peaks and troughs. For Chicago Bridge & Iron, it's looking like we have hit the bottom of one of those troughs. While revenue for the most recent quarter declined again on a year-over-year basis, the company did report that new project awards increased 50% and its book-to-bill ratio -- the amount of projects that were added to the company's list of work divided by the amount of revenue recognized in the quarter -- was 1. This is the first time this year that new project awards were equal to revenue, which signals that the company won't have to rely on drawing down its backlog of projects for revenue. As a modest recovery starts to take hold in the energy sector, Chicago Bridge & Iron will likely start to see an uptick in project awards that should at least cover all recognized revenue and hopefully start to build its backlog back up. 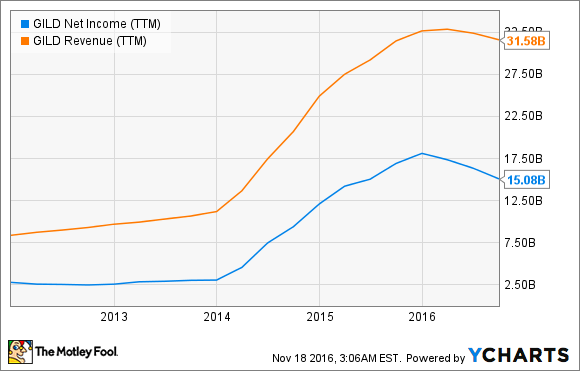 Chicago Bridge & Iron's dividend yield of just 0.8% certainly won't wow anyone looking for income investments. With shares of the company trading at a total enterprise-value-to-EBITDA ratio of 4.92 times, though, it looks like Chicago Bridge & Iron's stock could be headed for a strong rebound. Based on the stock price of Gilead Sciences, the market seems to be focusing awfully hard on its current treatment options for both hepatitis C and HIV, its two largest markets. These treatments have by far been the company's bread and butter for a while now, but increasing pressure from competitors has seen sales stall out. As a result, revenue and net income have started to decline in 2016, and the company's stock is down 25% year to date. Gilead carries an enterprise-value-to-EBITDA ratio of 5.66 times. GILD Net Income (TTM) data by YCharts. If the suites of treatment for HIV and hepatitis C were Gilead's only avenue for future growth, then investors would have plenty of reasons to be concerned about the future. This theory, though, puts an awfully heavy discount on Gilead's pipeline of research and development that has made some decent strides in other places. The company is working on multiple treatments right now for nonalcoholic steatohepatitis (NASH), a market that could be as big as $40 billion, as well as treatments for hepatitis B. Gilead also has an interest in making inroads in the field of oncology through strategic acquisitions. As with any pharmaceutical or biotech company, the research and development process is a messy one that may not always lead to results. However, with so many irons in the fire, it greatly improves Gilead's chances at another blockbuster treatment. If one of its current development-stage treatments can gain market appeal, chances are investors will quickly overlook the recent declines in its current offerings.